13" MBA, current generation running current OSX. Granted, the font is larger...poor eyesight here. 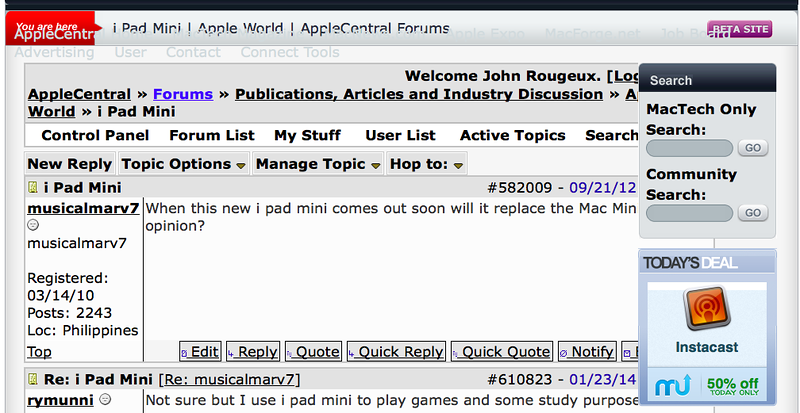 ha but those ads to the right ------> seem to intrude on the forums. Appears fine on my iMac. I'll fudge around with the font size later, but shouldn't it auto-adjust to the font size that a person chooses? And along the top there, you can see links/words out of place. Right click to make the picture bigger to see what I"m talking about. Yeah, the problem is the font size. There's only so much we can do. It's fine on my 11" MBA. Get yourself a trifocal, John!